Prostate cancer is the most common malignancy and the third primary cause of cancer deaths in males in the United States, as per the American Cancer Society. Xenograft preclinical studies aid in the discovery of new treatment regimens for prostate cancer patients. The LNCaP epithelial cell line was isolated from the supraclavicular lymph node metastasis of a Caucasian male in 1977. LNCaP can grow in aggregates or as a single cell. The LNCaP cell line has a high affinity for androgen receptors and is receptive to hormones. A 2015 study by Yang et al. published in PLoS One investigated if the combination of quercetin and 2-Methoxyestradiol (2-ME) could inhibit the LNCaP xenograft tumor growth in vivo. According to the article, the combination of quercetin and 2-ME blocks tumor growth in the LNCaP xenograft model and decreases side effects of quercetin or 2-ME alone, suggesting that it could be an innovative treatment approach in human prostate cancer. Lange et al. released a Clinical Cancer Research article (2012) using the LNCaP xenograft model to study aberrant glycosylation patterns and how they relate to tumor progression. Results revealed that Mgat5b appear to be biomarkers for metastatic competence and establishes β(1,6)-branched oligosaccharides as significant for prostate cancer progression; these results were also in agreement to the serum analysis of human a patients and were correlated to disease-free survival. In 2016, Byrne et al. released a study in the British Journal of Cancer evaluating the effects of androgen deprivation in LNCaP xenografts. Single-agent androgen deprivation therapy (ADT) is a prostate cancer treatment that also shows high relapse rates; results from this study revealed that ADT led to high hypoxic stress, increased VEGF related angiogenesis and upregulation of epithelial to mesenchymal transition genes. This suggests that ADT relapse may be mediated through hypoxic stress resulting in supported tumor growth and malignant progression. The LNCap cell line (human prostate) is used to create the CDX (Cell Line Derived Xenograft) LNCaP xenograft mouse model. 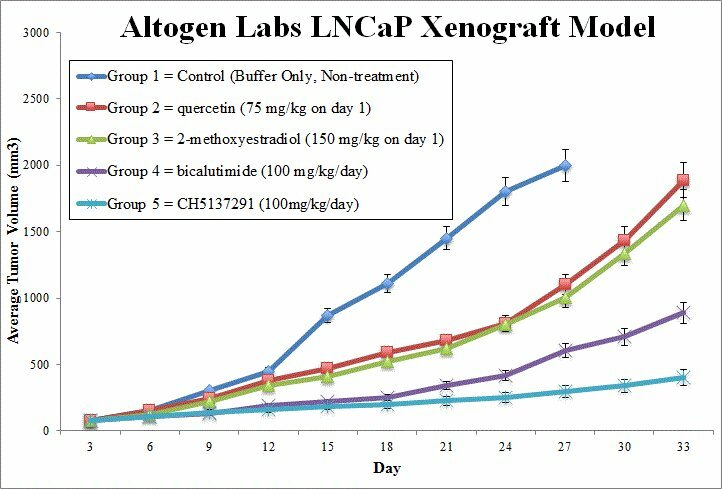 The LNCaP xenograft model is androgen sensitive (mutated androgen receptor, AR T877A) and can be treated with modalities such as an androgen receptor antisense oligonucleotide or bicalutamide. Cells are grown under aseptic conditions prior to collection and at exponential growth. LNCaP cells are then collected and viability is determined. Trypan blue is utilized to ensure a minimum of 98% viability of the cells. Cell suspension concentrations are adjusted such that in 100 µL of the Matrigel + LNCaP cell suspension there are one million cells (volume of injection is 100 µL). Inoculations are made into the s.c. flank of a hind leg per mouse. The mice are nu/nu and 10 weeks old. Calipers are applied for monitoring tumor growth, with tumor sizes of 50-150 mm3needed for study initiation. Animals are then sorted into necessary groupings and client provided compounds are administered. Tumor measurements and mouse weights are recorded until end of study. Tumors are removed, their weights recorded and documented digitally. Tissue samples can be isolated for nucleic acids, submersed in RNAlater reagent, prepared for histological analysis or snap frozen.